My digital copy of this magazine turned up the other day and some travelling recently has let me catch up with the contents of it faster than I normally do (the wargaming magazines tend to be lunchtime reading for me so it can take a few lunches before I get through one – a reason my magazine reading is falling behind schedule). I noted before on 26 April 2013 the Miniature Wargames with Battlegames looked more like an expanded Battlegames than an expanded Miniature Wargames. Still, it was a pleasing read then. I was interested then to see how Henry Hyde, the editor, managed an issue with presumable more time to prepare than the first issue. This issue was better than the last (always an positive when you have just resubscribed) with a number of interesting articles. Neil Schuck (known for his podcasts, the Simple Tags and View from the Verandah) provides the column, forward observer, looking at new items and matters of interest – this month concentrating on the UK Games Expo ((held at the Metropole Hotel, one I know well from business trips to London in the 1980s)) as well as some World War II, Steampunk, Medieval and SciFi scenery. Diane Sutherland shows how to make a French-Indian Wars fort. A very talented woman Diane, especially in regards to scenery and such. There is a good World War 1 piece on Messines. The Irishman Conrad Kinch and Mike Siggins both take me back to the 1970s with their old style of writing and in Kinch’s case, the faux Flash Gordon-esque “bring me the bore worms” – missing was Princess Aura’s “No! Not the bore worms!” Also missing was the evil pause, it should be “bring me … the bore worms”. Please, it is 2013 and I am a grown adult who likes to play with toy soldiers, not a sixth-former trying to sound like a 1940s fighter pilot ((I should also mention that Flash Gordon is one of my favourite SciFi tales from the 1930s “I’d much rather see you on my side, than scattered into… atoms.” and “take him to the Disintegrating Room”)). Perhaps my favourite articles this time were provided my John Treadaway. Treadaway is one of the organisers of Salute, the big London Wargames show. He is also responsible for my feelings of complete inadequacy with my figure painting. Lastly, however, he is also known for his role in Slammers Hammers, a SciFi world and game. I had noticed articles about it in the past in previous issues of Miniature Wargames and not paid any attention. Last night, after dinner, over coffee I read Treadaway’s description of Slammers Hammers and was quite impressed. Come September I shall start looking more at this. There are also articles on Command Challenge; Whispering Death (my father was taken in by that propaganda); Medieval tournament brawling; some Arthur Harman (that is tonight’s reading on the flight back to Singapore); and the Recce section looking at new releases of figures, books and such. 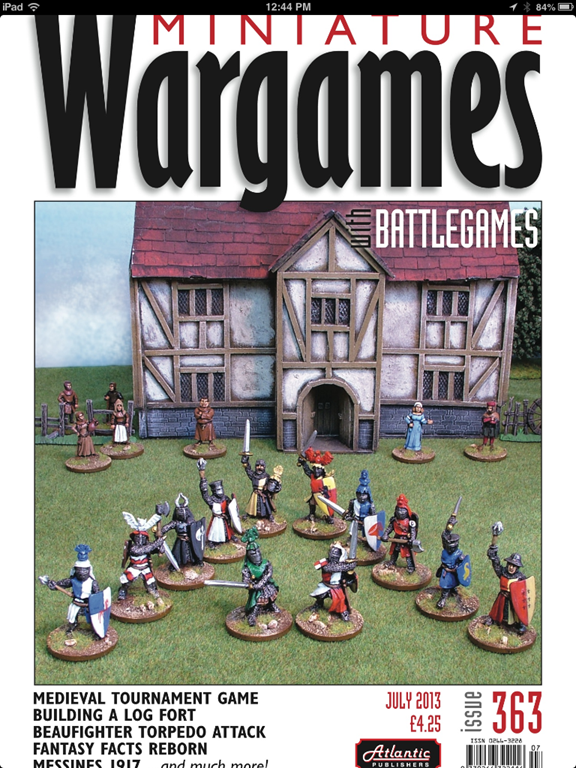 Overall, the magazine still looks and reads like an expanded Battlegames but I think it is improving and starting to deliver what Miniature Wargames had for recent years promised to but never delivered. A good magazine for a general wargamer. Details from Atlantic Publishers or the Facebook page. “Hammer’s Slammers”… and a couple of the books are available for free – search for Baen ISO, free ebook. I tried posting the link, but the blog doesn’t like it.